This app allows you to listen to and control stations from your current Pandora account, rate songs, view song history and album artwork, and use global key commands to pause and skip playback. Over here at Tech Heavy we always have music streaming while we are writing up stories and tips. The most popular music streaming music service as of late is Pandora (in the U.S. at least, other countries have been lucky enough to be able to use Spotify). While Pandora is a great service it lacks the ability to run outside of a web browser in Mac OS X. This all changes with the new Mac App called Pyrcast. 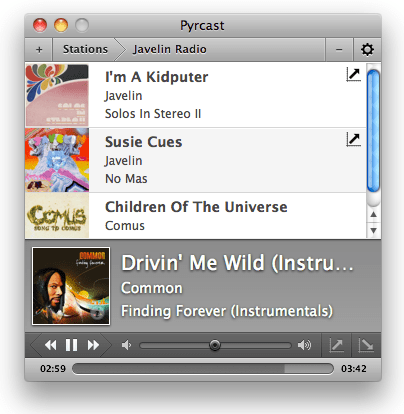 With Pyrcast you no longer have to rely on a Flash-based browser to enjoy your music. You can listen to and control stations from your current Pandora account, rate songs, view song history and album artwork, and use global key commands to pause and skip playback. Pyrcast also allows you to set up Growl notifications to update you of each new song that plays. The app shows promise with more features to come in the next update, the developer says Pyrcast will eventually be placed within your Menubar and allow you to control your stations from there. We love Menubar app’s as they stay out of your way but also allow you to access the application in a moment’s notice. Pyrcast is currently available at the Mac App store for $5.00, and runs on OS X 10.6 or later. Remember, in order to access the Mac App store you must have OS X 10.6.6 or later. If you are looking for help obtaining that update check out our post on Software updates. Another thing which must be noted is a free Pandora account is required to use the app.